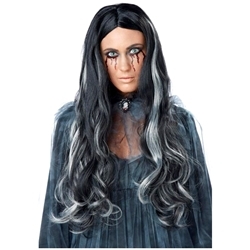 The Bloody Mary wig is a mix of both black and gray hair in a long and slightly wild style. It can be used for a number of different characters including witches, ghosts, spirits, and zombies. The Bloody Mary wig is colored as pictured.